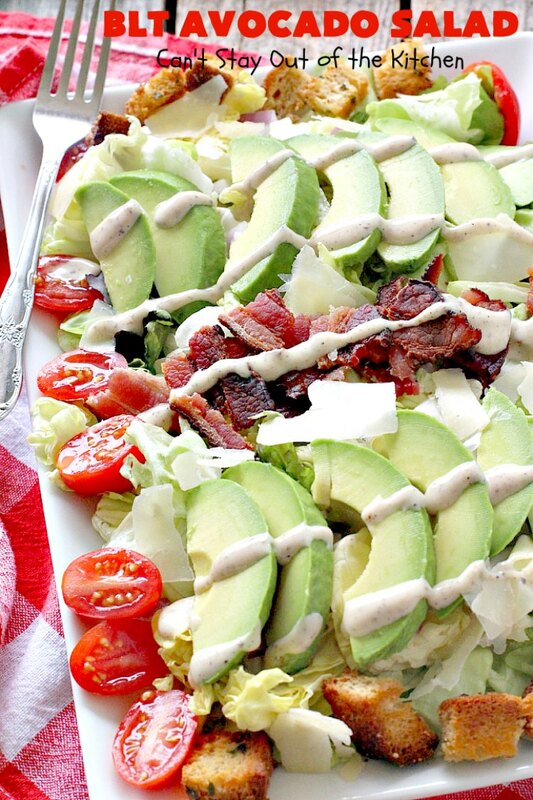 I LOVE, LOVE, LOVE this BLT Avocado Salad! I love a good BLT Salad anyway, but one with avocados amps it up even more. I started out with the traditional bacon, lettuce and tomatoes. 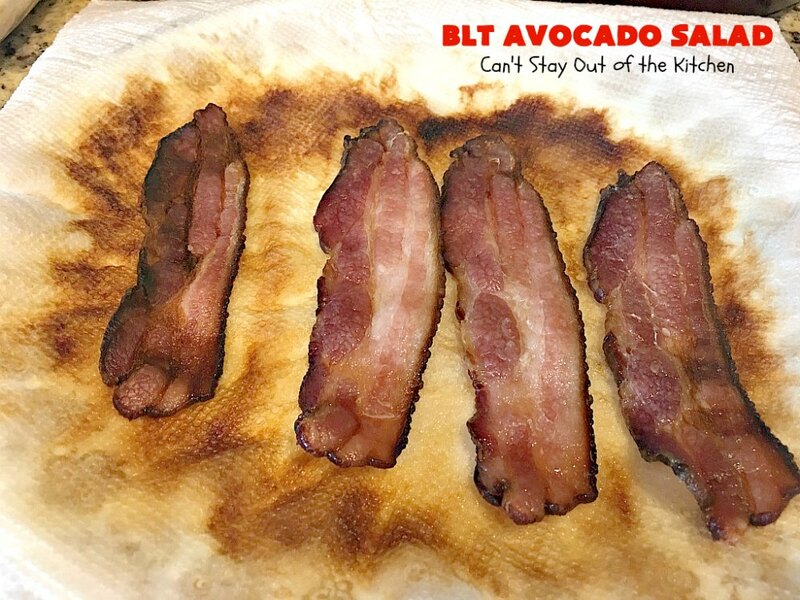 But I used a preservative-free, nitrate free, uncured bacon to keep the recipe healthier. I added shaved parmesan cheese (every salad has to have cheese, right???) 🙂 Then I tossed in some of my favorite gluten free croutons, which add great crunch to the salad. Finally, I added a little bit of finely diced red onion to give it a little pop, and a couple of delicious avocados. I served it with a creamy Caesar dressing. Did I say this salad was to die for? Oh, it was sooooo good. I eat a fair amount of salads. But one thing I can’t do is eat the same salad over and over and over. I get sick of eating the same thing repeatedly (no matter what kind of food it is). Since food is so much more plentiful than it was 40-50 years ago there’s no reason not to have variety. 🙂 So I am ALWAYS trying new things. Yes, I circulate the old favorite recipes back into our menus every now and then but I love eating new foods. My Roasted Corn Salad, Steak Fajita Salad, Strawberry Blueberry Avocado Salad and Tomato Avocado Mozzarella Salad also have avocados. Adding avocados are a great way to increase good oils into your diet. But they’re also very filling. 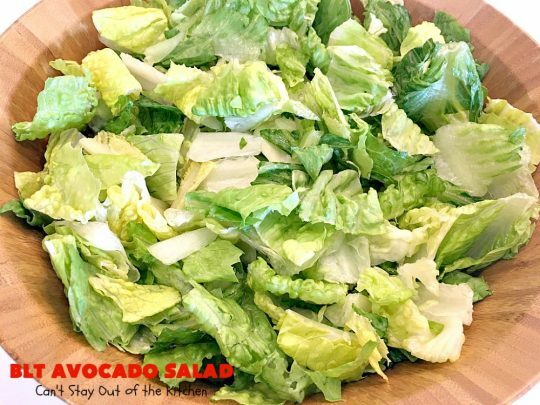 You won’t be hungry so quickly after eating this salad. I didn’t make this salad for company or to take a meal to anyone. I made it for me! My husband is not an avocado lover (can you believe it???)!!! So I ate ALL of the salad over a couple of days. I was in seventh heaven because I loved it. 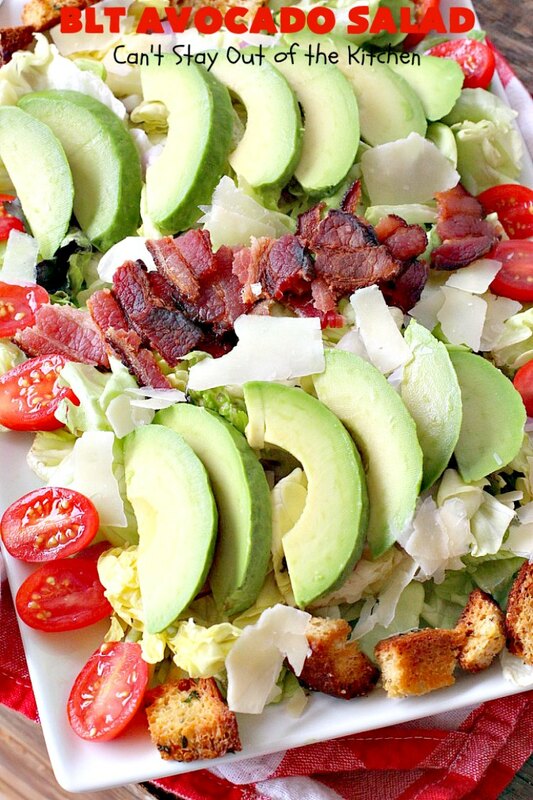 I didn’t skimp on the avocados or the bacon or the Caesar dressing. Yum. BLT Avocado Salad was so mouthwatering. 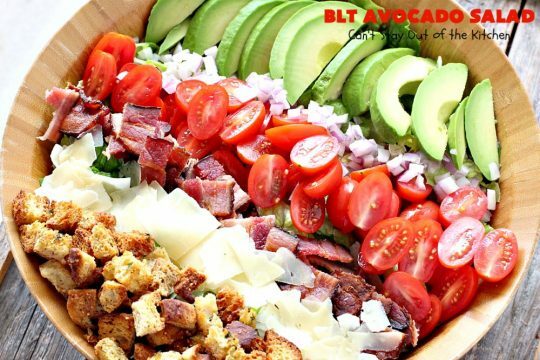 BLT Avocado Salad is a great salad to serve for company, especially if everyone likes avocados. I served the salad with a Caesar dressing. Amazing. I used these ingredients. 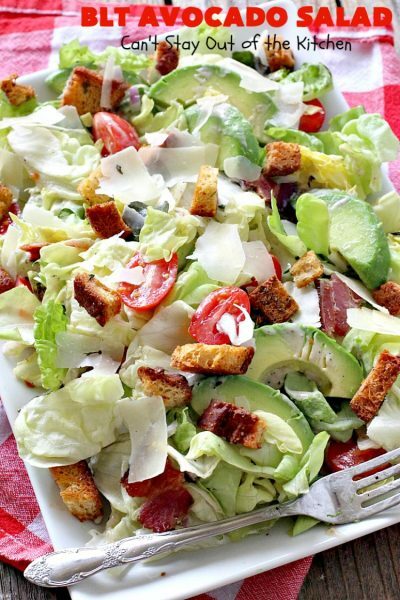 The croutons are homemade and the bacon is uncured and nitrate and preservative free. 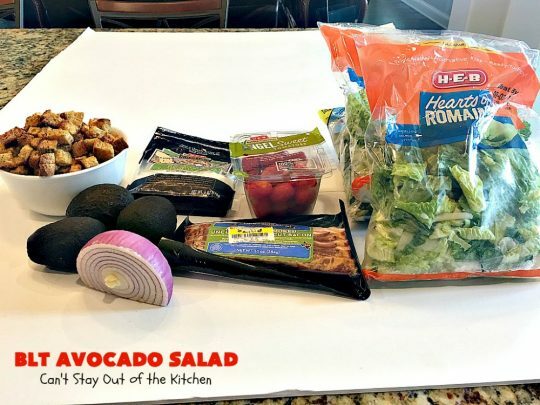 Fill salad bowl with lettuce. Cook bacon and break into pieces. I prefer to microwave it between two paper towels on a microwave-safe plate. You can also oven bake the bacon, if you prefer. 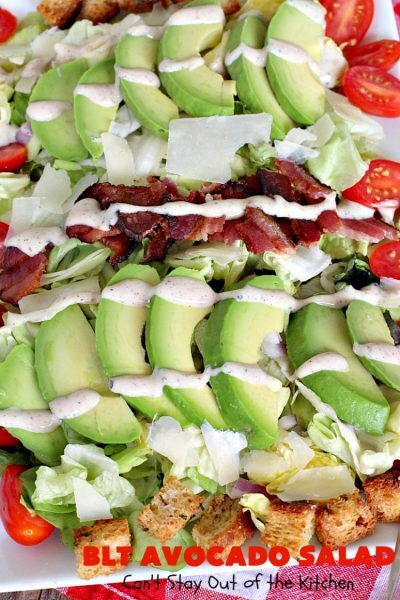 On top of the lettuce, layer avocados, red onion, grape tomato halves, bacon, shaved parmesan cheese and croutons. Omit croutons if you’re not going to serve the salad immediately, and add just before serving. Spread salad onto your plate. Prepare to wolf down enjoy the best BLT salad ever! 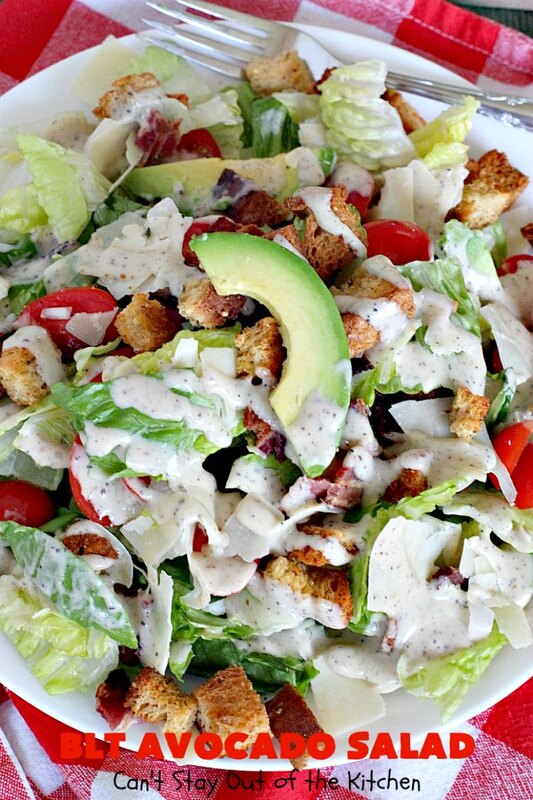 Drizzle with Caesar salad dressing or Creamy Parmesan Dressing and enjoy! Croutons keep this salad nice and crunchy. The parmesan cheese and avocados along with the bacon add a delicious texture to the salad. The red onion gives it just enough bite to keep it interesting and not bland. This fabulous salad starts with the traditional bacon, lettuce and tomatoes, but adds avocados, shaved parmesan cheese, red onion and homemade gluten free croutons. 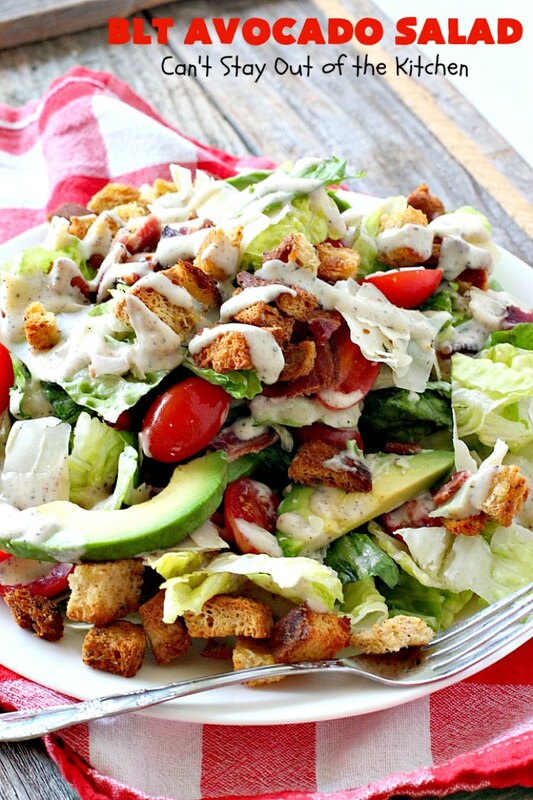 It's wonderful served with a creamy Caesar dressing. 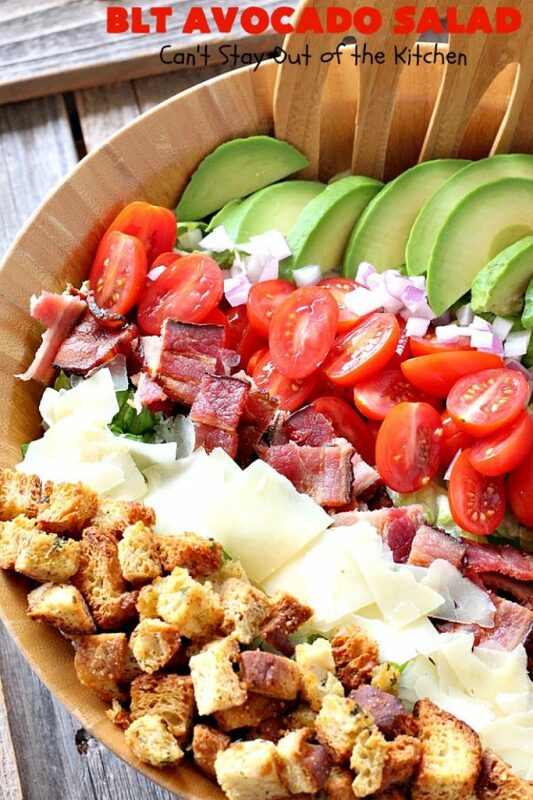 Layer salad, tomatoes, avocados, onion and parmesan cheese in salad bowl. Toss with Creamy Parmesan Dressing or Caesar dressing before serving. NOTE: While I used only 10-ounces of bacon, I think 16-ounces would be better! I loved this delicious salad. It’s great for lunch or as a main dish salad. It’s hearty, filling and satisfying. 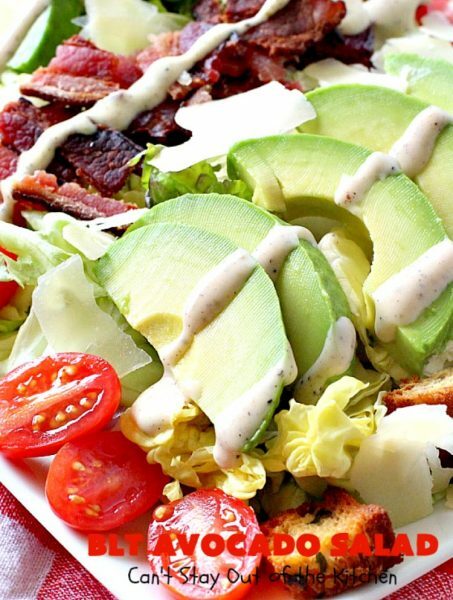 BLT Avocado Salad is great to serve for lunch with friends. This delectable salad is the perfect entree to make when you’re too tired to do a lot of cooking! Add some grilled chicken and you have a healthy, gluten free, clean eating recipe you can really enjoy.